Interactive whiteboards are increasingly installed to enhance the learning environment in Danish elementary schools. A tight economy forces the schools of Copenhagen to buy the less expensive interactive whiteboards on the market. The result of which, is low light output, low contrast and poor visual conditions for the students. The natural response to a low light projection is to close the blinds and turn the general lighting level to a minimum. Students must squint to get a clear visual. This stresses the optical sensory system unnecessarily and removes the focus from the learning process. The daylight is taken away from the students and eventually society pays the price. 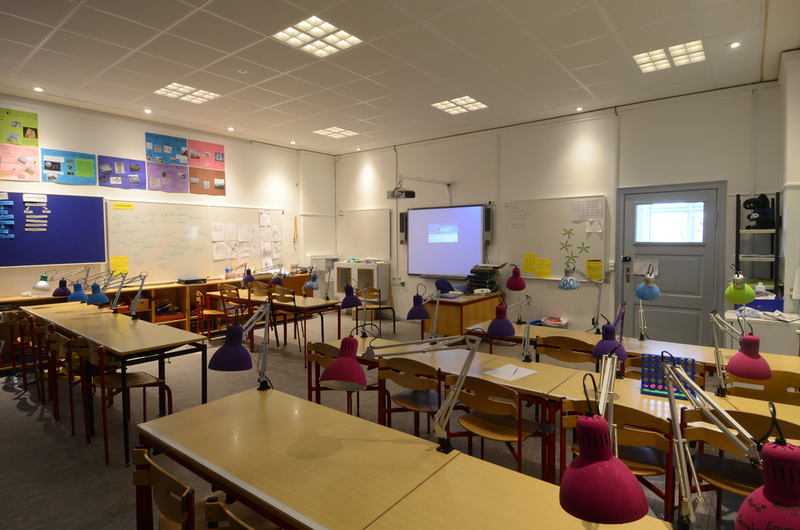 We designed a lighting system for future classrooms with interactive whiteboard equipment. A three component system; General lighting, vertical surface lighting and individual table lamps. A lighting scheme that supports the flexibility of a modern classroom. A picture of a danish classroom at grøndalsvænge school. Every classroom today regardless of condition will have an Interactive Smartboard installed. The smartboard i ON. The pupils was released with paint and their new private light to make it personal and build a relationship. Basic lighting from the ceiling 3x3 fixtures. The lighting is uniform and creates no contrast. Everything has visually equal priority in this light. There is no fixed focus for the eye and the smartboard projection is almost invisible from the back of the classroom. Vertical illumination is vital for human beings. The vertical lighting defines the space and creates a comfortable space with enhanced contrast that provides focus for the eyes. The smartboard projection is more visible. The vertical lighting defines the space and provides the general illumination. Personal table lamps provides the tasklighting for taking notes. The smartboard projection is highly visible and contrastfull.